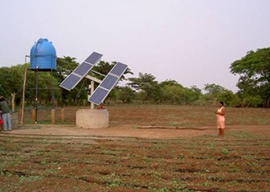 In drip irrigation systems, water is distributed at low pressure (app. 2 bars). Drip irrigation systems can also be used to distribute fluid fertilizer directly to the roots and hereby fertilizer increases the efficiency of deployment and reduces fertilizer expenses. 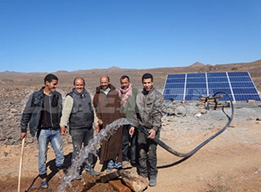 Solar pumps lift the water from canals, rivers or wells; afterwards the water flow is done by gravity, so called “gravity irrigation systems. The system pressure is very low (1 to 3 meters). Therefore a high volume, low pressure pump is needed. In this case a centrifugal pump is most adapted for open surface water with a low content of dirt or organic material. The normal lift is approx. 1 to 15 meters. The tank capacity should be equal to the minimum daily requirement as security stock. The water is lifted from canals, rivers or wells; afterwards the water flow is done by gravity, so called “gravity irrigation systems”. For border irrigation, used mainly for paddy rice production, the water is poured into a basin until is reaches a certain height related to the plant development of e.g. the rice seedlings. The young plants (roots) are complete grown in stagnated water. Periodically the irrigation is repeated until the crops are mature and ready for the dry harvest. 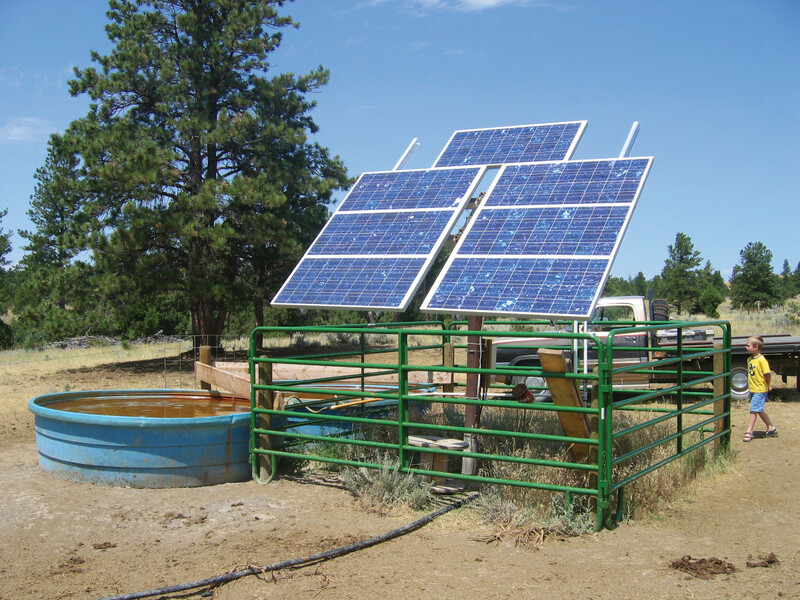 Following are some of LORENTZ solutions for watering in livestock applications, based on the standard demands for the number of animals, as shown: Example: LORENTZ pump PS200 HR-07, powered by 200W PV module at 25 m TDH produces water flow 6.5 cubic meters per day. 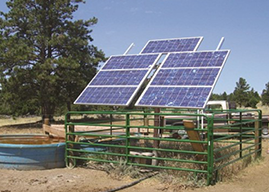 That solution is enough for livestock watering for: 60 Milk Cows, 810 Sheep and 26000 Chickens. The UNICEF consumption figures of water requirement per person is average 30 liters /day, here we can apply the following examples to show standard demands and pumping solutions for drinking water supplied by LORENTZ: •	LORENTZ PS 1200 HR-07, powered by 660 Wp PV modules, can provide daily drinking water for 300 persons. 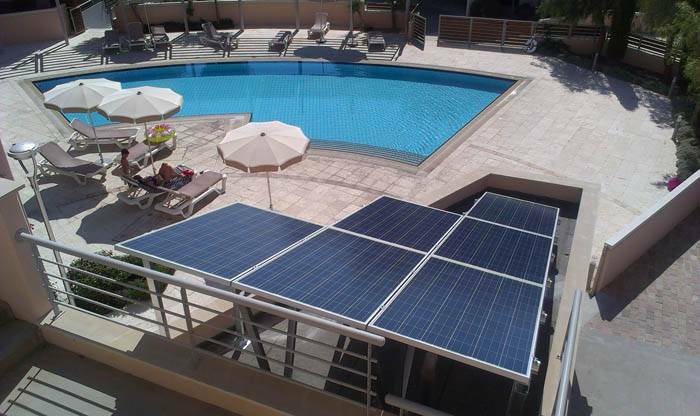 •	LORENTZ PS 1800C SJ5, powered by 2100 Wp PV modules, can provide daily drinking water for 1000 persons. 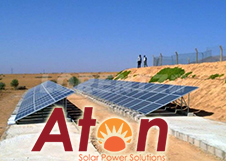 ATON Egypt delivers sustainable, renewable energy solutions of products and packaged systems. 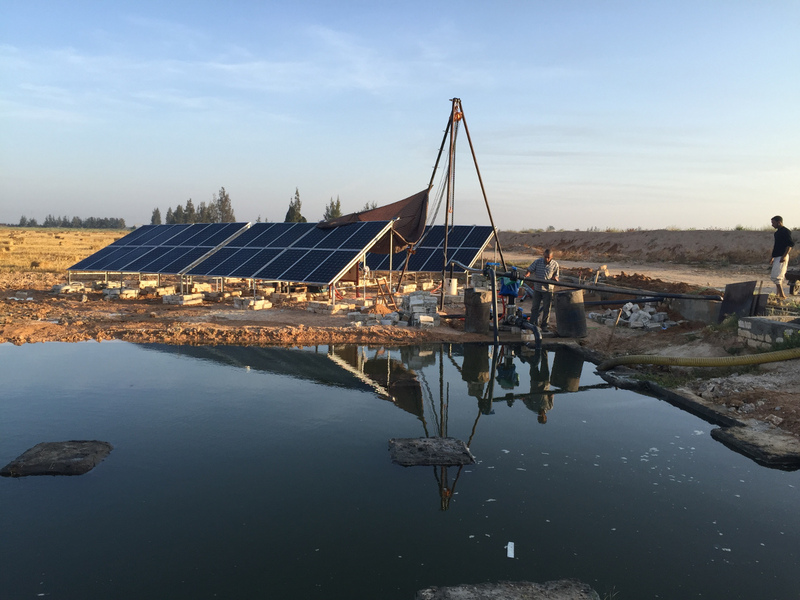 We provide turnkey projects for Solar Water Pumping Systems in the remote areas that cover a wide range of applications such as irrigation, drinking water, livestock, and water circulation and purification systems. 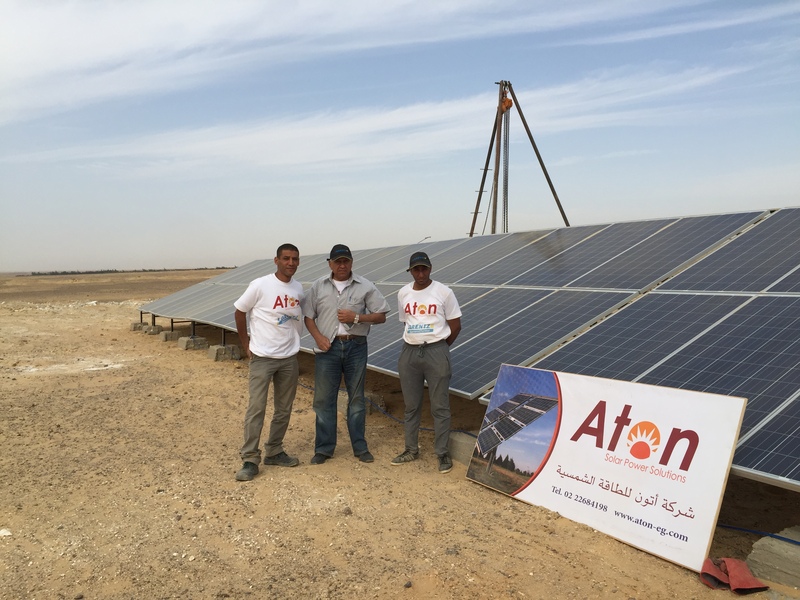 ATON Egypt is a proud partner with LORENTZ GmbH, the worldwide specialized and leading company in producing the Solar Water Pumping Systems. LORENTZ pumps portfolio spans a nominal power range from 0.15 kW to 30 kW; covering lifts up to 350 meters and flow rate up to 450 m3/h. LORENTZ submersible pumps are deployed in irrigation systems, drinking water provision, water treatment and livestock. While LORENTZ surface pump systems are used as circulating pumps for swimming pools and filtration systems. 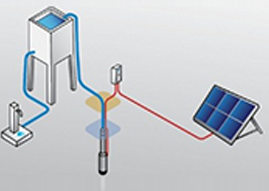 LORENTZ solar pumps are, also used as booster pumps for many applications. 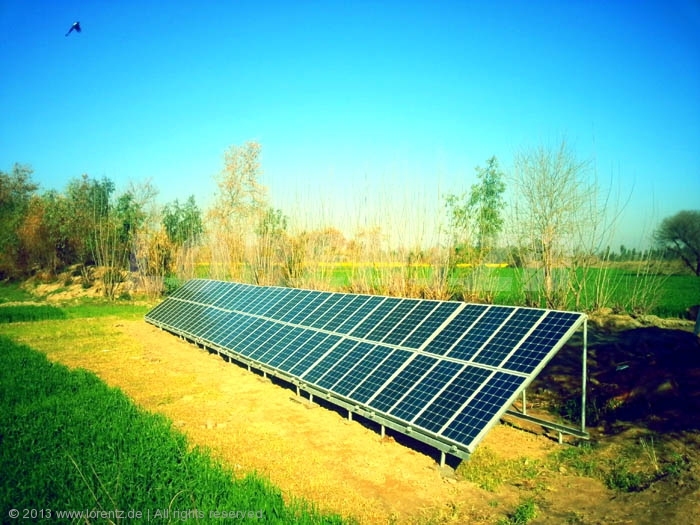 We provide also Solar LED lighting, and Off-Grid packaged systems, and many more.